When a customer makes the purchase decision on your site website, they always wonder that how much they should pay for the product shipping. And Shipping Cost Calculator Extension for Magento 2 can preview shipping price of any product they want or shipping prices of products in the cart through filling in country, state/province, zip code in "Calculator Shipping" form. + Admin can use any shipping method and inform customers about shipping costs of every product. + Your website will become more professional in customer's eyes with short loading time for shipping cost. + Estimate shipping cost for any product you want or estimate shipping cost of all items in the cart. + Show the suitable shipping method and shipping cost follow customer's address (country, state/province, zip code). + Easy to estimate shipping prices of any products in product detail page or category page. Step 1: Select product to estimate shipping cost: Option 1: You can go to the detail page of this product, you will see form "Calculator Shipping" below button "Add to cart". Or, Option 2: In category, you hover over product you want to estimate shipping cost, you click on button " Estimate Shipping"
Step 2: Fill information in " Calculator Shipping" form: You can fill in manually information as: Country, State/Province, Zip code or you click on "Get informations from IP address" link to fill address automaticallly. You can tick on checkbox " Include items in the cart" to estimate shipping cost for this product and product that have added to cart. Finally, you click on button "Estimate Shipping". Step 3: View Shipping Cost result: After you click on button " Estimate Shipping" , you will see shipping cost of this product in Shipping Rate of form " Calculator Shipping". Step 4: Make purchase decision: You select product with suitable product price and shipping cost to add to cart. Then, you implement place order as usual. Step 2. 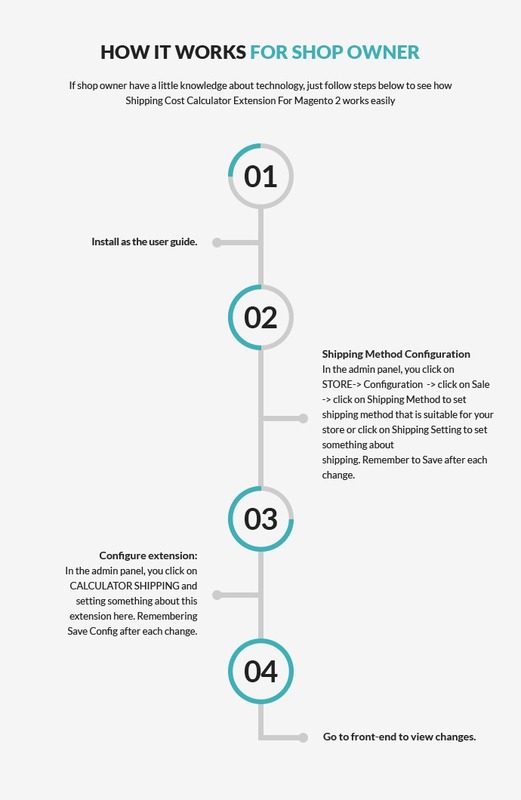 Shipping Method Configuration: In the admin panel, you click on STORE -> Configuration -> click on Sale -> click on Shipping Method to set shipping method that is suitable for your store or click on Shipping Setting to set something about shipping. Remember to Save after each change. Step 3. Configure extension: In the admin panel, you click on CALCULATOR SHIPPING and setting something about this extension here. Remembering Save Config after each change. Estimate shipping cost for any product: Your customers can pre-calculate the shipping cost for any product you want or a specific order at one click. 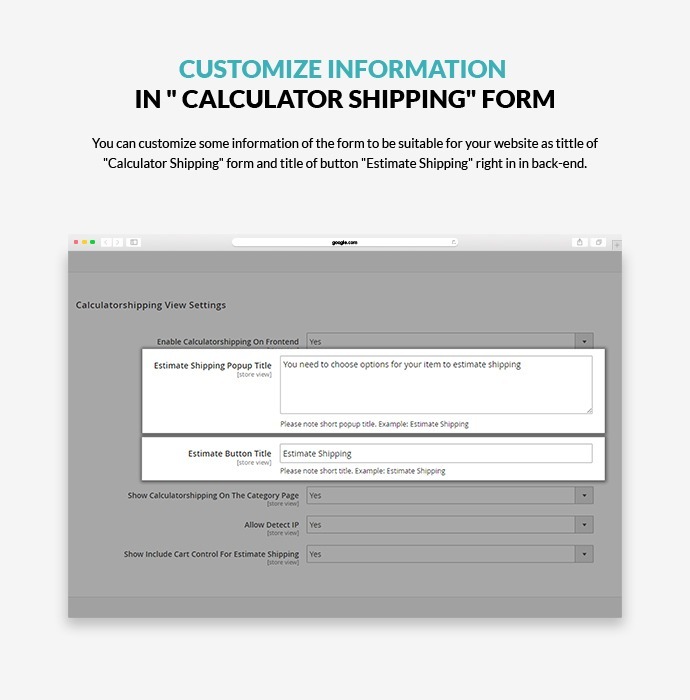 "Calculator Shipping" Form Display on the main page: Customers can calculate the shipping price of a product on any page like the category page or the product details page. 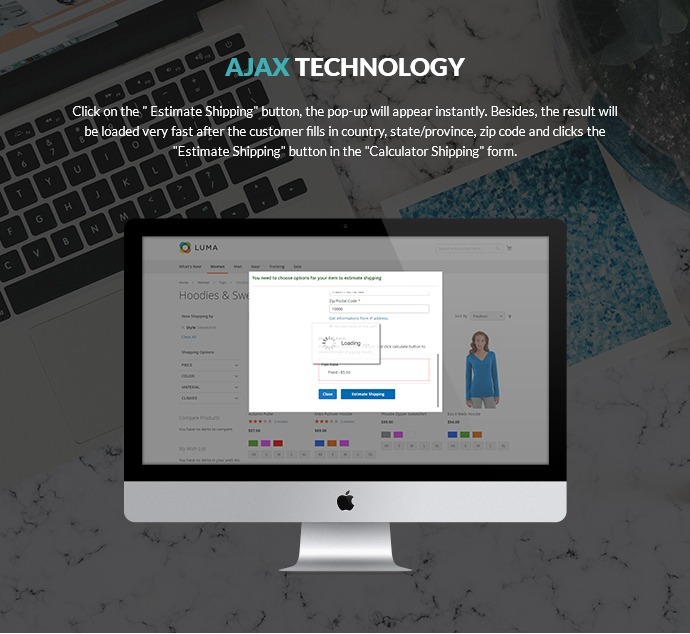 Ajax Technology: Click on the " Estimate Shipping" button, the pop-up will appear instantly. Besides, the result will be loaded very fast after the customer fills in country, state/province, zip code and clicks the "Estimate Shipping" button in the "Calculator Shipping" form. Geo IP Technology: Automatically detect a customer's country and state/province for where they are. 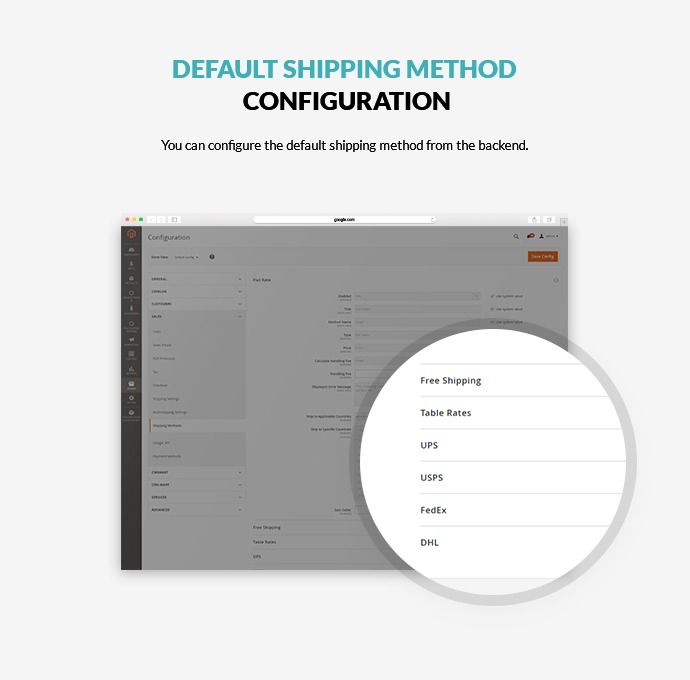 Default shipping method Configuration: You can configure the default shipping method from the backend. 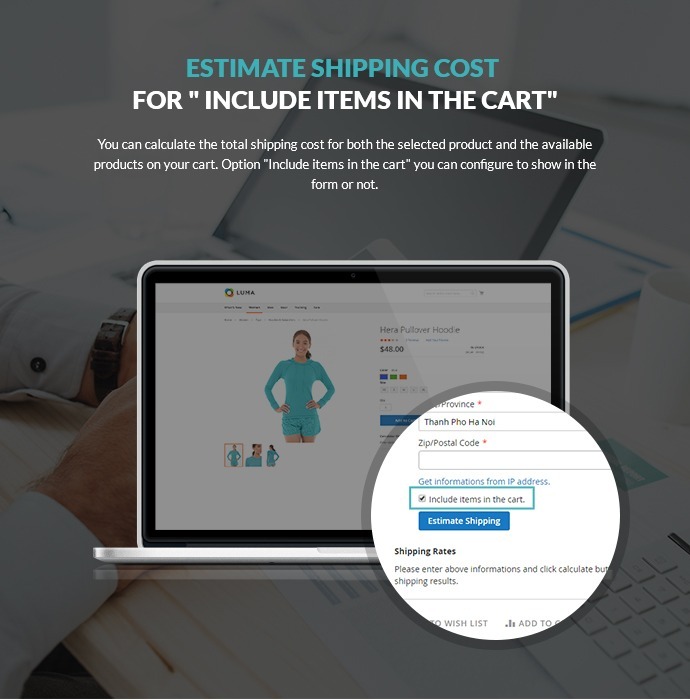 Estimate shipping cost for " Include items in the cart": You can calculate the total shipping cost for both the selected product and the available products on your cart. Option "Include items in the cart" you can configure to show in the form or not. Customize information in " Calculator Shipping" form: You can customize some information of the form to be suitable for your website as tittle of "Calculator Shipping" form and title of button "Estimate Shipping" right in in back-end. Show the shipping rates result: Shipping rates will be placed in " Calculator Shipping" form after you select the option and fill in the country, state/province, and zip code. I receive quick response from support and the issues too are resolved promptly. Thank you..
Extension works great! Had Customization done by Neo to put it under a Tab rather then out front on the product Page. Vincent in sales had great follow up and customization was done quickly after payment. Will use this company / extensions again. Great solution for calculating shipping costs! Thanks for the support and help during installing the extension from the CMSsmart developers! This is unique and nice extension for the customer to see how much is the shipping cost for each product items you choice. 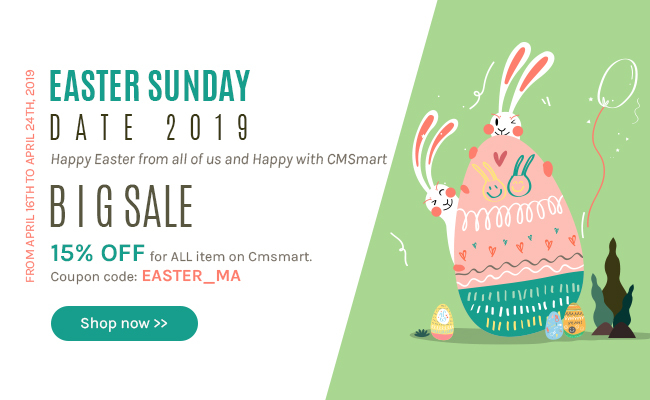 Great magento extension in CMSmart. Thank for the CMSmart developer, specially victor.. you really help me man! Thumbs up!
. Working stably and smoothly. What else could be better? Give you five stars! Can I enable/ Disable the Calculator shipping On Frontend? Yes, you can enable/ disable the calculator shipping on Frontend in admin. Configuration-> Calculator Shipping-> Calculator shipping View Settings-> Enable Calculator shipping On Frontend. If you want to enable, choose “Yes”, or else, choose “No” to disable it. Yes, it is compatible with any theme of Magento 2. It is easy to integrate with other Magento 2 theme and it makes your website more professional and attractive. Yes, she/he does. Admin can customize some information of the form to be suitable for your website as tittle of "Calculator Shipping" form and title of button "Estimate Shipping" right in in back-end. Is it possible for the shipping rate to display after customer select the options and fill in the information such as country, state/ province, and Zip Code. Yes, it is. The Shipping Cost Calculation does support this feature. The Shipping rates will be placed in "Calculator Shipping" form after you select the option and fill in the country, state/province, and zip code. Does it automatically detect a customer's country and state/province to know where they are. Yes, it does. With Geo IP Technology, it automatically detects a customer’s country, state or province. Yes, it can be. You can calculate the total shipping cost for both the selected product and the available products on your cart. Option "Include items in the cart" you can configure to show in the form or not. Can admin configure the default shipping method from the backend? Yes, she/he can. The default shipping method can be configured in backend. Yes, it can be. The customers can calculate the shipping price of a product on any page like the category page or the product details page. Yes, it will be automatically update your information as well as your history of purchase. -Auto Renewal Payment: with this package, you have 12 months to receive our support, download and upgrade FREE. But, after 12 months you only pay a small recurring fee for each 12 months, you DON'T need to buy the product again. - Standard Payment: You only pay ONCE for this payment, you will receive our support, download and upgrade free in 12 months. But after 12 months, if you want to upgrade, download or support, you HAVE to buy again. Bringing customers the best service is very important for e-business now because how they feel and how they get from our web-site will discuss whether they make online purchase and continue for the next times. Understanding that, e-commerce solutions providers develop their extensions according to the to trend of customer’s needs while ensuring SEO, powerful admin panel and full control the of management of web-store owners. Magento 2 always saves its No.1 position with regard to the e-commerce open-source platform. 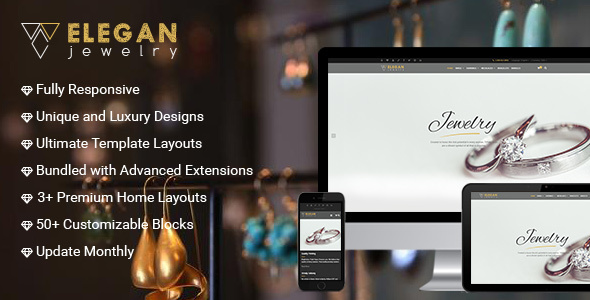 Innovative and intelligent features of extensions of this version do make both web-store owners as well as customers very happy when doing shopping online. Until now, almost necessary features like Checkout, Search, Affiliates or Product video are added to Magento 2 store with the corresponding module. However, we hardly find out the feature Shipping calculator on Magento 2 solution marketplace to make our store more perfect. Then, today we will introduce you a new feature that might be added to your store named Magento 2 Shipping Cost Calculator. Magento 2 Shipping Cost Calculator, at first, is a feature on Magento 2 store, and strongly developed by NetBase team. This function allows customers to estimate shipping cost for any products on the detail page and category page. And they also can estimate shipping cost for all items in the Cart as they wish. How can You add the module into your Magento 2 store? Step 2: In order to process configuration of the module, please go to the Admin panel and clicking on Store -> Configuration -> Select Sale and then clicking on Shipping Method to set shipping method that is adjustable with your store. After that, clicking on Shipping Settings to set something about shipping and please remember to click on Save button after any changes. Step 3: Then, click on Calculator Shipping and do the setting of something of this extension here. Also, remember to save configuration after each change. Step 4: Now, go to front-end and enjoy your installation and configuration of the module. As you may know, NetBase’s extensions are created for all types of web-store owners, from the beginners to experts in Magento 2 platform. Thus, you can find it not complicated to finish installation or use. You can set up the module through some above steps and if necessary, let their team support you for advanced configurations. You can save much cost with this idea when it compatible with any theme. It is ensured to properly work with other Magento 2 theme. Moreover, it will make your web-site look more professional and attractive as well. 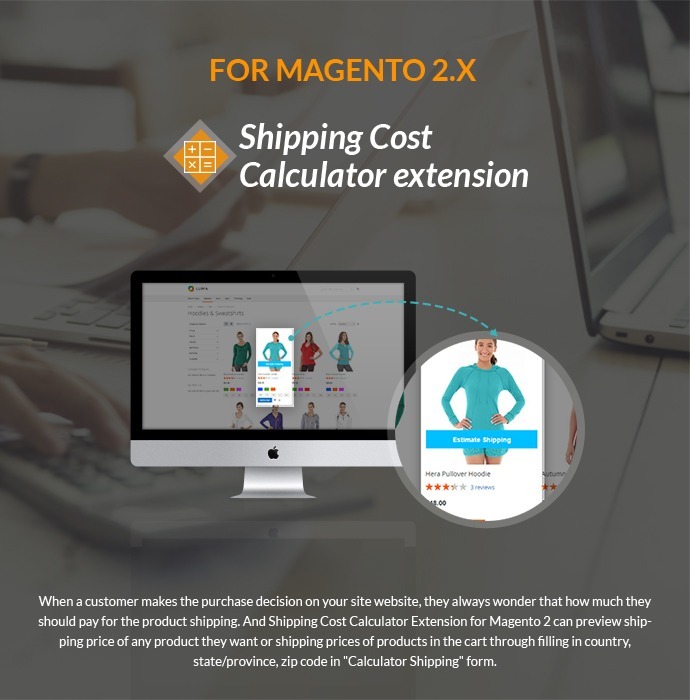 How Magento 2 Shipping cost Calculator module serves your Customers? Estimate shipping cost for any product you want or estimate shipping cost of all items in the cart. Show the suitable shipping method and shipping cost follow customer’s address (country, state/province, and zip code). Your customers can pre-calculate the shipping cost for any product you want or a specific order at one click. Besides, “Calculator Shipping” Form is Display on the main page so they are able to calculate the shipping price of a product on any page like the category page or the product details page. Ajax Technology is supported, allowing customers to click on the “Estimate Shipping” button, the pop-up will appear instantly. 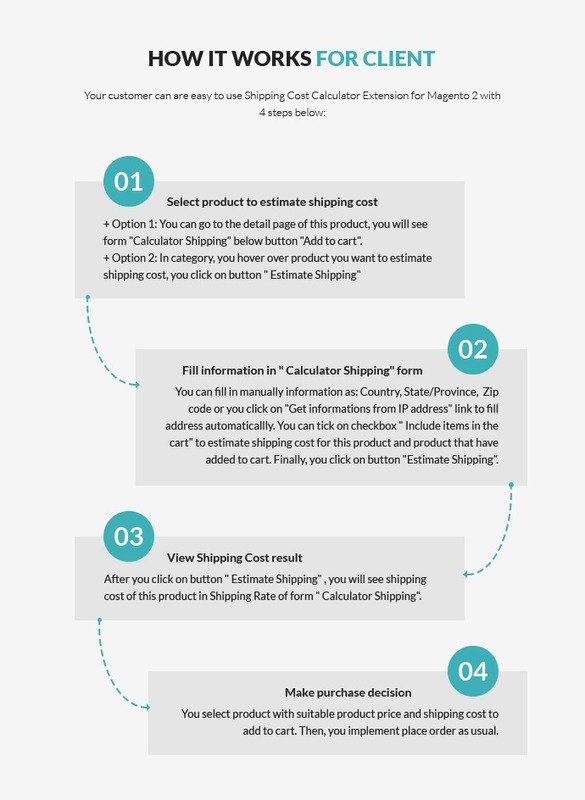 Then, the result will be loaded very fast after the customer completes their shipping information and clicks “Estimate Shipping” button on the “Calculator Shipping” form. Geo IP Technology is one of the success factors. This strong tool automatically detects a customer’s country and state/province where they are. 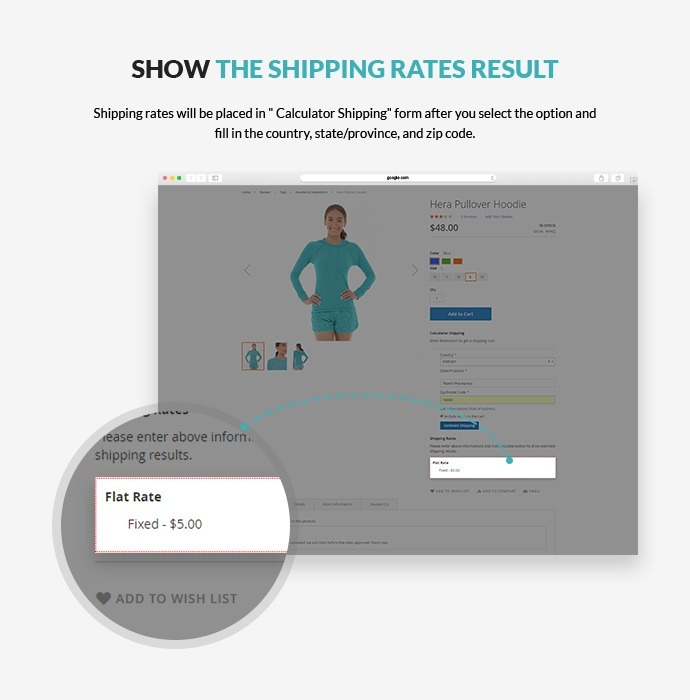 Customers also know the shipping rate result because shipping rates will be placed in “Calculator Shipping” from right after shoppers select the option and fill in enough information. And customers are impossible to calculate the total shipping cost for both the selected product and the available products on your cart. Another good notification of the module Magento 2 Shipping calculator is that you can have it with a small amount of investment. However, it will be an ideal tool for you to keep customers’ loyalty and encourage them to do online purchase in your store. 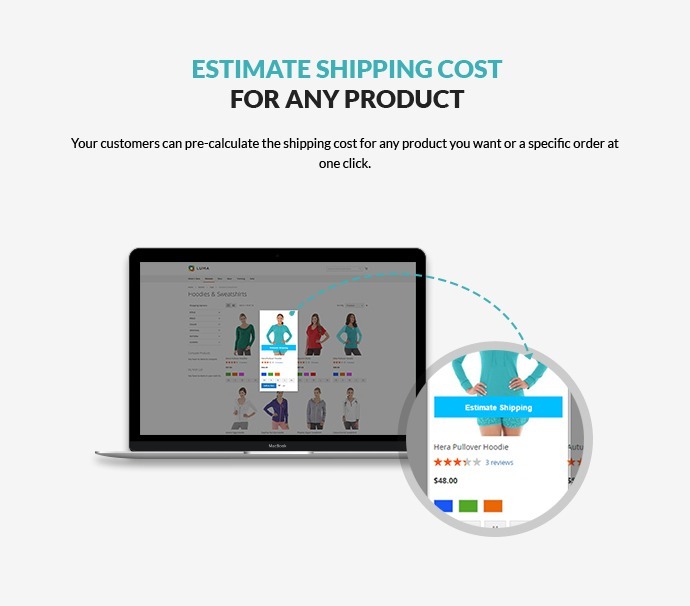 Estimating shipping cost for any products: Just with one click, your customers can get pre-calculation of the shipping cost for any product they want or a specific order. 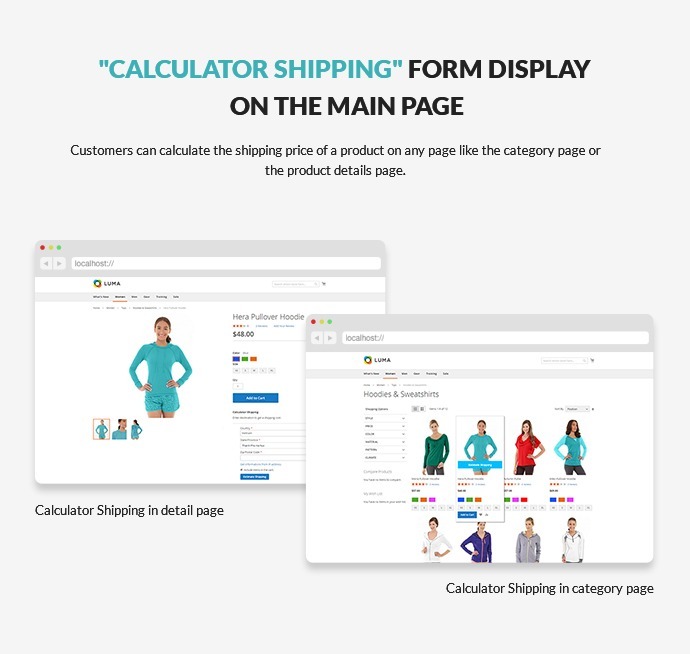 Displaying CALCULATOR SHIPPING on the main page: Magento 2 shipping calculator allows your customers to calculate the shipping cost of any products they choose from any page like product details page or category page. Ajax Technology: When you click on ESTIMATE SHIPPING button, there will be a pop-up appears immediately. After customers fill in all the information in terms of country, state, province, zip code, click ESTIMATE SHIPPING button appearing in the CALCULATOR SHIPPING form, the total cost will be loaded very fast. 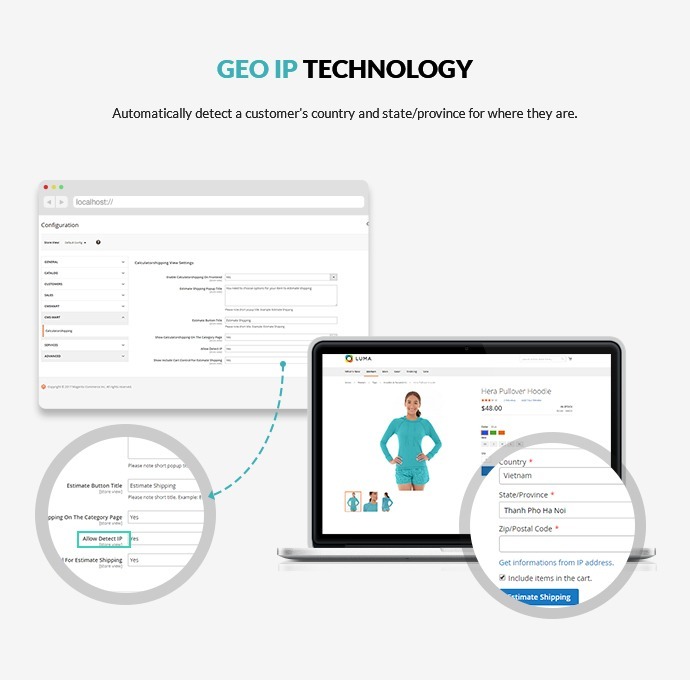 Geo IP Technology: with this feature, your website can automatically where customers are in terms of their country, state, province, etc. Default shipping method Configuration: Admin can carry out this process in the backend conveniently. Estimating shipping cost for Included items in the cart: What does it mean? It means customers will know the total shipping cost calculated for both the selected products as well as the available products in their cart. If you find it is not needed for you, you can hide this estimating cost form. Customizing information in CALCULATOR SHIPPING form: it is simple to customize some information included in the form to make it suitable for your website’s requirements. You can change in the backend. Showing the shipping rates result: With Magento 2 Shipping calculator, Shipping rates will be placed in ” Calculator Shipping” form after you select the option and fill in the information about the country, state/province, and zip code. 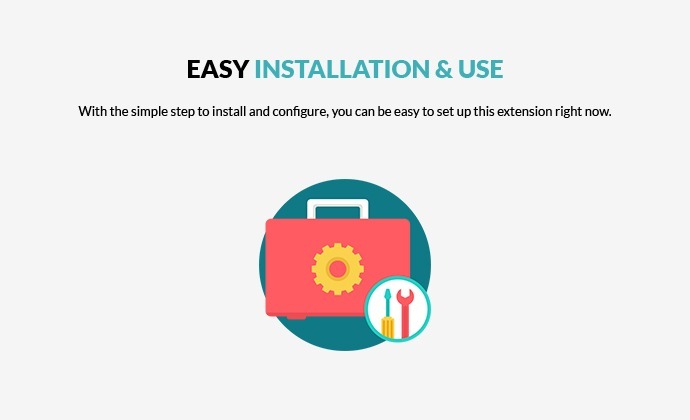 Easy to install and use: Our Magento 2 extension just require you to go through several simple steps to finish installing process. It will not take too much time and your effort to make this extension ready to use. 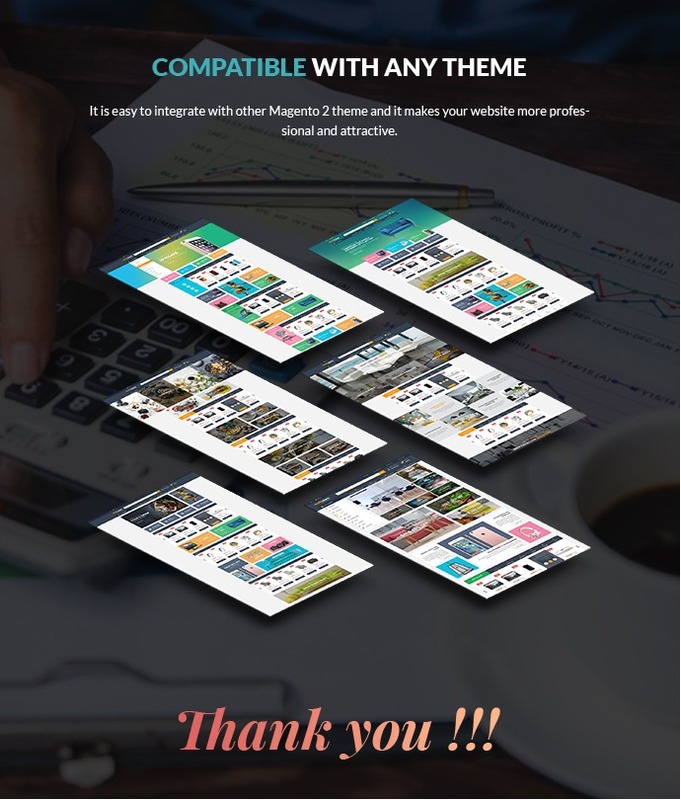 Compatible with any theme: Magento 2 now is the trend so we make Magento 2 Shipping calculator easy to integrate with any Magento 2 theme so your website will appear more professional and attractive and works more smoothly. All in all, what I mentioned above are just the outstanding features of this extension. There are so many awesome things that are waiting for you to explore. We believe that the more you explore it, the more you love it.